Everyone's favorite food holiday has arrived. Sunday, July 15, is National Ice Cream Day, an excellent excuse to eat even more ice cream than you normally would in the sweltering summer heat. In New York City, there are tons of places to find free ice cream in celebration of one of mankind's greatest creations. There are also plenty of options to try something weird and unexpected, like mochi or beer-infused ice cream. Here are all the places in NYC offering free and cheap ice cream to celebrate National Ice Cream Day. The deal: If you download the DQ mobile app, you'll automatically be given a coupon for a free small Blizzard at New York-area DQs. Here are the details. The deal: Get a taste of the collision of mochi dough and ice cream at the Winky Lux Clubhouse at 69 Ludlow St. If you know you're stopping in you can RSVP here. The deal: For National Ice Cream Day, you can get buy-one-get-one-free ice cream cones, buy-one-get-one $0.99 sundaes, and $2 off medium milkshakes if you download the Baskin-Robbins mobile app. The deal: Participating locations are offering a free mini cup. No purchase necessary. You just have to figure out what time your local shop is doing the promo. Then you'll be enjoying the ice cream of the future. The deal: Perks members (just download the mobile app) are getting a free ice cream sandwich with any purchase in the days leading up to National Ice Cream Day. The deal: All flavors are available in the shop's buy-one-get-one-free deal on soft serve cones and cups. The deal: Head to the Halo Top site and you can sample the company's new Peanut Butter & Jelly ice cream for free. The first 1,000 people to go to this link and use the code "HALOTOPPB&J" will get the goods. The deal: 16 Handles is offering three ounces of frozen yogurt for free. The deal: Get in on buy-one-get-one-free cones for National Ice Cream Day. It's made fresh daily. The deal: The first 25 guests get $1 ice creams and you can pick up buy-one-get-one-free ice creams from open to 6pm. After 6pm, you can get a free topping. The deal: In addition to a new mermaid cone, you can get buy-one-get-one-free ice cream cones. The deal: The first 50 guests will get free ice cream. The deal: Take part in a buy-one-get-one-free deal all day long. The deal: Every Whole Foods Market is offering a deal on Ben & Jerry's and Talenti ice cream pints. You can get any two of either brand for $6. Plus, Amazon Prime Members get an additional 10% off. You should try not to open your pint with a knife, though. 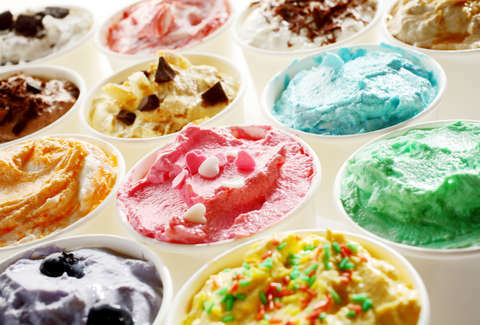 The deal: Text the word "SCOOPS" to 64827 and get $1 off any Ultimate Scoops Ice Cream at Cumberland Farms. The deal: The healthy "ice cream" -- it's vegan, paleo, and plant-based -- want to entice you to give it a try. You can get 25% off any order on the site with the code "ISCREAM25." The deal: Since beer ice cream is now legal in New York state, you can celebrate Ice Cream Day with something special and a little alcoholic. Melt is using the brewery's new Sam '76 for an ice cream that will sit between a pair of peanut butter cookies. 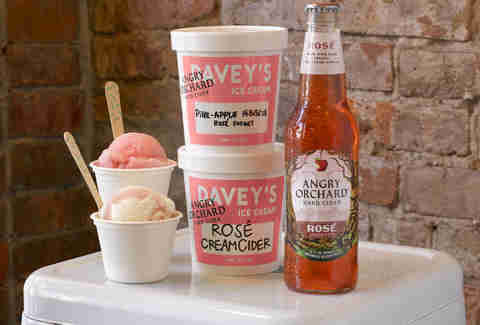 The deal: Davey's is giving Angry Orchard's Rosé Cider an ice cream twist at all of its New York locations, as well as at Angry Orchard's Walden cidery. Pick up either the Pine-Apple Hibiscus Rosé Sorbet or the Rosé CreamCider. If you know of National Ice Cream Day freebies and deals we missed, email us at news@thrillist.com and we'll add 'em here.